Thousands of flag-waving protesters marched into Pakistan’s capital Monday to demand changes to the country’s political system just months before scheduled elections. 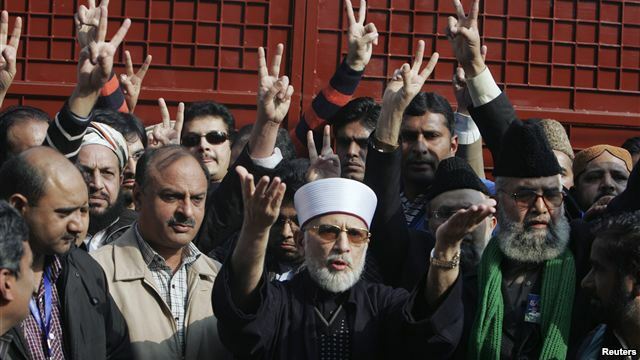 The rally is led by a Canadian-Pakistani cleric, Tahir-ul Qadri. Cellphone services were shut off, shops closed their doors, metal containers barricaded major roads, and riot police were at the ready as protestors entered the country’s capital city. Some 30,000 people were said to have arrived in Islamabad from the eastern city of Lahore in a two-day convoy. Another estimated 40,000 were expected to arrive overnight. Protest organizers had predicted the numbers would reach in the hundreds of thousands. Rally leader Tahir-ul Qadri is calling for the current government to step down as part of an overhaul of the country’s electoral system. National voting for a new government is expected to be held in a few months. Analysts say Qadri is tapping into the people’s deep frustration with ongoing violence and a deteriorating economy, but his campaign is unlikely to have a significant impact on the political system. But supporters like Mariam Khalid, who flew in from her home in Britain to join the protest, says Qadri stands for the kind of change the country needs. “Basically this is about change, and I know that is kind of vague and everyone wants change. The difference with this protest is that it’s not just about talking the talk, it’s about walking the walk as well. What Dr. Tahir-ul Qadri is saying is basically that the people are sick of it, the situation in Pakistan; there is no food, no electricity, people are dying — basically they are, that’s the reality,” Khalid said. Relatively unknown until he returned to Pakistan a few weeks ago, Qadri has spent the last seven years in Canada leading an Islamic charity group with branches around the world. Now his television ads are on all of Pakistan’s major stations to protest what he says is a broken and corrupt political system that any election will just perpetuate. If the national polls are held as scheduled, it will be the first time since Pakistan was formed in 1947 that a civilian government has completed its five-year term and peacefully handed over power to a new civilian leadership. Tariq Junaid, head of Pakistan’s Institute for Public Opinion Research, says Qadri’s slogans are attractive, but his ability to force a change in the electoral laws, or even delay the elections, depends largely on the pressure Qadri can bring to bear on the government. “Right now we have to see how much weightage the political parties will give to this. Apparently it seems like that, they are not taking it very seriously, they are letting it happen, and they think that in the due course of time it will die down, within the course of the next five or six days,” Junaid said. Junaid says as yet, there is a general consensus within Pakistani civil society that timely elections are the best way to remove corrupt politicians and give the country a fresh start. Pakistan’s embattled Prime Minister Yousuf Raza Gilani said Thursday he would rather go to jail than obey a court order and ask Switzerland to re-open graft cases against the president. Gilani’s remarks revive speculation that he would rather risk losing his job than capitulate in a two-year showdown with the judiciary that culminated last month with him being charged with contempt by the Supreme Court. He has always insisted that President Asif Ali Zardari is immune from prosecution as president and says the cases against him are politically motivated. “If I write a letter it will be a violation of the constitution, which is treason and which carries the death sentence,” Gilani told PhD students in central Punjab province, with a few in the audience shouting “do not write, do not write”. 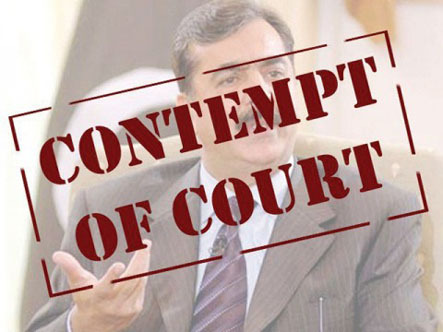 Pakistan’s top court last week ordered Gilani to ask Switzerland to reopen corruption cases against Zardari by March 21. It was the first time the court asked Gilani personally to write to the Swiss. It previously addressed repeated demands to the government since revoking in 2009 an amnesty freezing legal proceedings against key politicians. Zardari and his late wife, former premier Benazir Bhutto, were suspected of using Swiss accounts to launder about $12 million in alleged bribes paid by companies seeking customs inspection contracts in the 1990s. Zardari is so tainted by corruption allegations that he is nicknamed “Mr 10 Percent”. He has already spent 11 years in jail in Pakistan on charges ranging from corruption to murder although he has never been convicted. Pakistan’s former cricketer-turned-politician Imran Khan brought at least 100,000 people into the streets of Karachi on Sunday in a massive rally that increases pressure on the civilian government and cements his standing as a political force. Khan, 59, is riding a wave of dissatisfaction with the government of President Asif Ali Zardari, who co-chairs the ruling Pakistan People’s Party, and is facing challenges from the military, the Supreme Court and political opponents after a year of cascading crises. Police estimated the rally had been attended by between 100,000 and 150,000 people. Khan’s Pakistan Tehreek-i-Insaaf, or Pakistan Movement for Justice, estimated the crowd at more than 500,000. Even at the lower estimate, it is among the largest political rallies held in Karachi in recent years. Khan, in a rousing speech punctuated with patriotic musical refrains, pledged, if elected, to curb Pakistan’s endemic corruption. “I promise we will end big corruption in 90 days,” he added. Khan’s massive rally comes at a time of crisis in Pakistani politics. Tensions are rising between Pakistan’s civilian leaders and its generals over a memo that accused the Army of plotting a coup after the US raid that killed Osama bin Laden in May. There are signs that Pakistan’s powerful Army is fed up with Zardari and wants the Supreme Court or early elections to force him from office. The Army chief dismissed any rumours of a coup, however, as “speculation”. “It’s time for a change and only PTI and Imran Khan can bring about that change,” said Sabina Saifi, 28, a school teacher. She was wearing a PTI cap and had come with her two brothers. 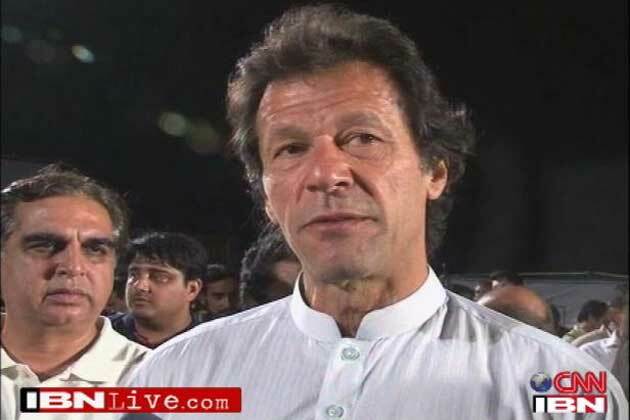 Several recent polls have shown Khan is Pakistan’s most popular politician. He is especially favoured in urban areas. On October 30, Khan staged a similar rally in Lahore that observers said pulled between 100,000 and 200,000 people, then one of the largest political rallies ever in Pakistan. “He has… managed to bring people out on the roads, and this is a big achievement, especially in Karachi, where three months back people were not ready to come out of their houses because of rampant violence and killings,” Ahmed said. But popularity doesn’t always translate into political power. The majority of Pakistan’s voters are rural, where feudal relationships determine generations of political loyalty. Khan, for all the enthusiasm shown for him among young people and the urban middle class, has yet to demonstrate the party machinery that the PPP and the Pakistan Muslim League-N faction have had decades to perfect. In the last 15 years, the PTI has only briefly held one seat in Parliament – Khan’s. Most analysts say Khan could score an upset of 20 to 30 seats in Parliament, but that’s not enough to give him the premiership. It is enough to make him a major political player, however – or even a kingmaker. “It’s too premature to get into speculation of whether he becomes prime minister or not but the chances of his party getting into Parliament look very good,” said security analyst Imtiaz Gul. He also has a touchy relationship with the United States, Pakistan’s ally and aid donor. He says that if elected prime minister, he would end cooperation in the fight against militants based in tribal areas, end the covert campaign of bombings by US drones and refuse all US aid, which totals some $20 billion since 2001. Relations with the United States have reached a crisis point because of a November 26 cross-border incident in which NATO aircraft killed 24 Pakistani troops. Pakistan has since shut down NATO supply routes into Afghanistan and demanded an apology. NATO’s full report on the incident, which Pakistan has already rejected based on media leaks, is expected to be released on Monday. It reportedly faults both sides in the incident. Khan’s anti-American stance is often thought to reflect the views of the security establishment, which includes the powerful Army and its Directorate of Inter-Services Intelligence. The US ambassador to Pakistan, Cameron Munter, however, said in November that he didn’t see Khan as anti-American. A day after Saudi Arabia’s military rolled into Bahrain, the Iranian government branded the move “unacceptable” on Tuesday, threatening to escalate a local political conflict into a regional showdown with Iran. “The presence of foreign forces and interference in Bahrain’s internal affairs is unacceptable and will further complicate the issue,” Ramin Mehmanparast, the Iranian Foreign Ministry spokesman told a news conference in Tehran, according to state-run media. Even as predominantly Shiite Muslim Iran pursues a determined crackdown against dissent at home, Tehran has supported the protests led by the Shiite majority in Bahrain. “We expect their demands be fulfilled through correct means,” Mr. Mehmanparast added. Iran’s response — while anticipated — showed the depth of rivalry across the Persian Gulf in a contest that has far-reaching consequences in many parts of the Middle East. On Monday, Iranian state-run media went so far as to call the troop movement an invasion. Saudi Arabia has been watching uneasily as Bahrain’s Shiite majority has staged weeks of protests against a Sunni monarchy, fearing that if the protesters prevailed, Iran, Saudi Arabia’s bitter regional rival, could expand its influence and inspire unrest elsewhere. The Saudi decision to send in troops on Monday could further inflame the conflict and transform this teardrop of a nation in the Persian Gulf into the Middle East’s next proxy battlefield between regional and global powers. On Tuesday, there was no immediate indication that the Saudi forces were confronting protesters in the central Pearl Square — the emblem of the Bahrain protest much as Cairo’s Tahrir Square assumed symbolic significance in the Egyptian uprising. Several hundred protesters camped out there on what seemed initially to be a quiet day with little traffic on the streets as the details of the deployment by Bahrain’s neighbors — and their mission — remained ill-defined. The decision is the first time the council has used collective military action to help suppress a popular revolt — in this case a Shiite popular revolt. It was rejected by the opposition, and by Iran, as an “occupation.” Iran has long claimed that Bahrain is historically part of Iran. The troops entered Bahrain at an especially combustible moment in the standoff between protesters and the monarchy. In recent days protesters have begun to move from the encampment in Pearl Square, the symbolic center of the nation, to the actual seat of power and influence, the Royal Court and the financial district. As the troops moved in, protesters controlled the main highway and said they were determined not to leave. Though Bahrain said it had invited the force, the Saudi presence highlights the degree to which the kingdom has become concerned over Iran’s growing regional influence, and demonstrates that the Saudi monarchy has drawn the line at its back door. Oil-rich Saudi Arabia, a close ally of Washington, has traditionally preferred to operate in the shadows through checkbook diplomacy. It has long provided an economic lifeline to Bahrain. But it now finds itself largely standing alone to face Iran since its most important ally in that fight, Hosni Mubarak of Egypt, has been ousted in a popular uprising. Iran’s ally, Hezbollah, recently toppled the Saudi-backed government of Lebanon — a symbol of its regional might and Saudi Arabia’s diminishing clout. But Bahrain is right at Saudi Arabia’s eastern border, where the kingdoms are connected by a causeway. The Gulf Cooperation Council was clearly alarmed at the prospect of a Shiite political victory in Bahrain, fearing that it would inspire restive Shiite populations in Saudi Arabia and Kuwait to protest as well. The majority of the population in Saudi Arabia’s eastern provinces, where the oil is found, is Shiite, and there have already been small protests there. The Bahrain government said that it had invited the force in to help restore and preserve public order. The United States — which has continued to back the monarchy — said Monday that the move was not an occupation. The United States has long been allied with Bahrain’s royal family and has based the Navy’s Fifth Fleet in Bahrain for many years. Though the United States eventually sided with the demonstrators in Egypt, in Bahrain it has instead supported the leadership while calling for restraint and democratic change. 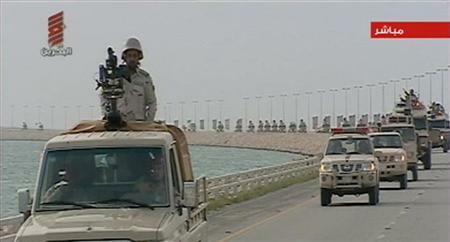 The Saudi official said the United States was informed Sunday that the Saudi troops would enter Bahrain on Monday. Saudi and council officials said the military forces would not engage with the demonstrators, but would protect infrastructure, government offices and industries, even though the protests had largely been peaceful. The mobilization would allow Bahrain to free up its own police and military forces to deal with the demonstrators, the officials said. But the officials also acknowledged that it was a message to Iran. “There is no doubt Iran is involved,” said the official, though no proof has been offered that Iran has had anything to do with the political unrest. Political analysts said that it was likely that the United States did not object to the deployment in part because it, too, saw a weakened monarchy as a net benefit to Iran at a time when the United States wants to move troops out of Iraq, where Iran has already established an influence. The military force is one part of a Gulf Cooperation Council effort to try to contain the crisis in Bahrain that broke out Feb. 14, when young people called for a Day of Rage, fashioned after events in Egypt and Tunisia. The police and then the army killed seven demonstrators, leading Washington to press Bahrain to remove its forces from the street. The royal family allowed thousands of demonstrators to camp at Pearl Square. It freed some political prisoners, allowed an exiled opposition leader to return and reshuffled the cabinet. And it called for a national dialogue. But the concessions — after the killings — seemed to embolden a movement that went from calling for a true constitutional monarchy to demanding the downfall of the monarchy. The monarchy has said it will consider instituting a fairly elected Parliament, but it insisted that the first step would be opening a national dialogue — a position the opposition has rejected, though it was unclear whether the protesters were speaking with one voice. The council moved troops in after deciding earlier to help prop up the king with a contribution of $10 billion over 10 years, and said that it might increase that figure. But if the goal was to intimidate Iran, or the protesters, that clearly was not the first response. 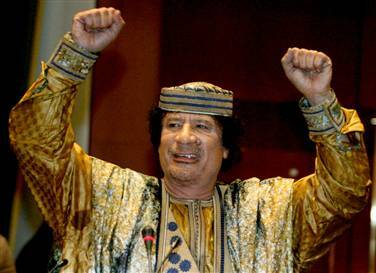 A defiant Moammar Gadhafi vowed to fight to his “last drop of blood” and roared at supporters to strike back against Libyan protesters to defend his embattled regime Tuesday, signaling an escalation of the crackdown that has thrown the capital into scenes of mayhem, wild shooting and bodies in the streets. The speech by the Libyan leader — who shouted and pounded his fists on the podium — was an all-out call for his backers to impose control over the capital and take back other cities. After a week of upheaval, protesters backed by defecting army units have claimed control over almost the entire eastern half of Libya’s 1,000-mile (1,600-kilometer) Mediterranean coast, including several oil-producing areas. Celebratory gunfire by Gadhafi supporters rang out in the capital of Tripoli after the leader’s speech, while in protester-held Benghazi, Libya’s second-largest city, people threw shoes at a screen showing his address, venting their contempt. State TV showed a crowd of Gadhafi supporters in Tripoli’s Green Square, raising his portrait and waving flags as they swayed to music after the address. Residents contacted by The Associated Press said no anti-government protesters ventured out of their homes after dark, and gun-toting guards manned checkpoints with occasional bursts of gunfire heard throughout the city. International alarm rose over the crisis, which sent oil prices soaring to the highest level in more than two years on Tuesday and sparked a scramble by European and other countries to get their citizens out of the North African nation. The U.N. Security Council held an emergency meeting that ended with a statement condemning the crackdown, expressing “grave concern” and calling for an “immediate end to the violence” and steps to address the legitimate demands of the Libyan people. Germany Chancellor Angela Merkel called Gadhafi’s speech “very, very appalling,” saying it “amounted to him declaring war on his own people.” Libya’s own deputy ambassador at the U.N., who now calls for Gadhafi’s ouster, has urged the world body to enforce a no-fly zone over the country to protect protesters. “This violence is completely unacceptable,” added Secretary of State Hillary Rodham Clinton. 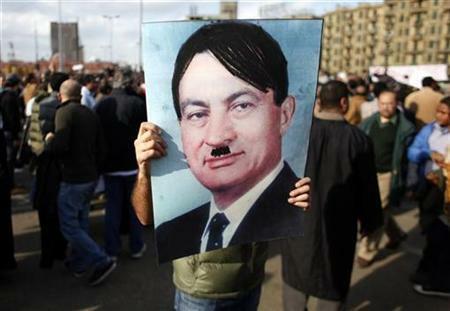 A massive demonstration is due to be held in Cairo as protesters step up their efforts to force President Hosni Mubarak from power. Organisers say they hope one million will come onto the streets in what is expected to be the biggest show yet. A rally is also planned in Alexandria. Egypt’s powerful army has vowed it will not used force against the protesters. Meanwhile, new Vice President Omar Suleiman says he will hold cross-party talks on constitutional reform. Mr Mubarak reshuffled his cabinet on Monday to try to head off the protests, replacing the widely despised Interior Minister Habib al-Adly. But correspondents say that the army’s statement has been a major blow for President Mubarak, and appears to have encouraged protesters. The BBC’s Middle East editor Jeremy Bowen, in Cairo, says that the feeling that change is coming in Egypt is getting stronger. Too much has happened too quickly to go back to the way things were before, he says. At least 100 people have been killed across the country since protests began a week ago following an internet campaign and partly inspired by the ousting of President Zine al-Abidine Ben Ali in Tunisia last month. Egypt has since cut off internet in the country and text messaging services have been disrupted. Google announced late on Monday that it is operating a special service to allow people in Egypt to send Twitter messages by dialing a phone number and leaving a voicemail. Some protesters defied the curfew and continued to camp out in Tahrir Square through the night, saying they will stay there until Mr Mubarak’s 30-year-long rule ends. One of them, Tarek Shalabi, told the BBC that groups were camped out in tents or sleeping out in the square, and described the atmosphere as “overwhelming”. “We’re here because we want to make a statement. 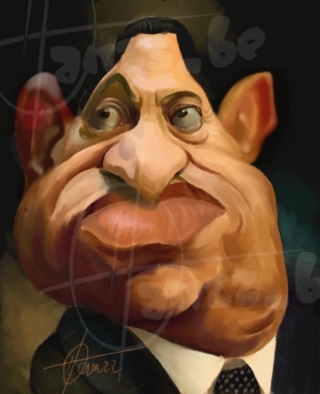 We’re not going until Mubarak steps down,” he said. He said a stage had been set up where people could go up and make speeches, read out poetry or sing or chant political slogans. “It has a festive feel to it,” he said. We all have one thing in common. We all hate the current regime,” he said. Another demonstrator, 45-year-old lawyer Ahmed Helmi, said: “The only thing we will accept from him is that he gets on a plane and leaves”. On Monday, the Egyptian army said it respected the “legitimate rights of the people”. Our correspondent says the announcement is absolutely critical because it takes away a huge measure of uncertainty from the mind of any potential demonstrator. Whatever happens next, this will change the Middle East, our correspondent adds. In his statement, Mr Suleiman said the president had ordered new government policy to be outlined “in the next few days”. The review would include “clear and definite policies” to tackle unemployment, poverty, corruption and the cost of living, the statement said. There would also be new elections in some districts where there was evidence of irregularities in last November’s parliamentary poll. Meanwhile, the US state department has despatched a special envoy to Cairo, former ambassador to Egypt Frank Wisner. Concerns have also grown about the economy, as global oil prices on Monday topped $100 (£62) a barrel amid fears of the ongoing unrest. Following the political earthquake that removed Tunisia’s President Zine el-Abidine Ben Ali from power nearly two weeks ago, seismic waves have been shaking ruling regimes from Algeria to Egypt, and from Jordan to Yemen. But if political earthquakes could somehow be measured on a “political” Richter scale, the question would be: Is this a magnitude 3 mild tremor that will pass, leaving behind little damage to the region’s authoritarian regimes and dictatorships? Or will it prove to be a magnitude 7 shocker, causing serious damage to a number of regimes? Watching and reading Arab pundits and political analysts offers no conclusive answer. Most of the pan-Arab press appears to be celebrating the “Jasmine Revolution” that brought down the Tunisian dictator, cheering on protesters in Egypt, Algeria, Yemen, and Jordan and the rest of the Arab world. Meanwhile, Arab leaders have been at pains not to appear opposed to “the will of the Tunisian people” while at the same time trying not to encourage the spread of the “democracy virus” to their own countries. It is anybody’s guess how events will ultimately unfold in Tunisia, where a transitional government made up of remnants of the “ancien regime” and a group of opposition and independent figures is trying to appease the disorganized and still angry masses, promising sweeping political reforms and democratic elections within months. But so far Tunisia’s revolution has only gone halfway, removing a president and shaking the establishment but not gutting the entrenched regime that still holds considerable power. That regime includes a military-security establishment that might decide, at any moment, to take things into its own hands and decide the future of the country, for better or worse. It would be naive to assume that Tunisia has already made the transition from dictatorship to democracy before the current standoff unfolds, a process that may take several months and could turn bloody at any moment. But the events in the region have certainly dispelled a number of myths and offered a few lessons for governments and observers. Perhaps the most important myth is that the Arab regimes, most of which have been ruling for decades, are too resilient and cannot be toppled, except through foreign military intervention or an inside coup or seizure of power. The other myth now being seriously questioned throughout the Arab media is that Islamists are the only alternative to these secular or apparently secular regimes. In Tunisia, the Islamists appeared to have little visible influence in the popular uprising, while the Muslim Brotherhood in Egypt has deliberately kept a low profile, perhaps for tactical reasons, leaving the disorganized popular masses of protesters of various political shades to take the lead. Understandably, most of the official and semi-official Arab media have recognized people’s “right to peaceful demonstration and freedom of expression,” echoing calls from Washington and the West, but warned, at the same time, against actions that may undermine stability and security. Wisely, many governments in the region, including that of Jordan, have moved quickly to reduce the prices of consumer goods and promise political reforms to preempt an escalation of popular anger. 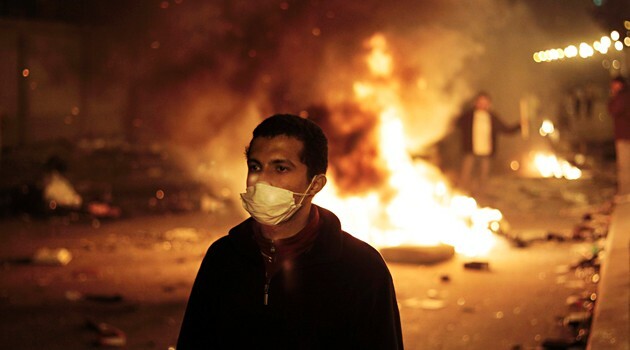 But unlike previous protests in Egypt and other Arab countries, this time the region’s leaders and their governments have not rushed to blame “foreign forces,” namely the U.S. and other Western countries, for instigating the riots. Tunisia’s government had always adopted a pro-Western stance, but today the West, which had turned a blind eye to human rights violations in that country for decades, is now almost silently watching as that regime crumbles, without any sign of wanting to do anything to save it. However, one might argue that this month’s protests are not only the product of worsening living conditions resulting from the global economic crisis and homegrown corruption and mismanagement. They are also the product of decades of political oppression and humiliation by regimes that are now beginning to realize they can no longer oppress their own people with impunity. Social media and other modern and widely accessible communications tools have stripped these regimes of their monopoly on information. And since knowledge is power, the power is now shifting from the ruling few to the unruly masses, and these masses, in turn, are challenging the status quo throughout the region. But it is certainly too early for pro-democracy advocates in the region and beyond to bring out the Champagne glasses. It isn’t over till it’s over, and it is definitely not over yet.